How to install/upgrade/increase RAM: Every once in a while, I will be posting an easy-to-follow and easy-to-do computer hardware and software tips and tutorials. My main aim is to provide in my own little way some technical help and advice to those who are still lacking the know-how on fixing or doing the most basic computer related tasks. RAM is short for Random Access Memory. It is the area where your computer stores programs that you are currently running and data that you are currently working on. 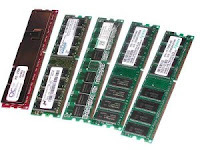 RAM is different from disk storage, e.g. hard-drive. Each and every one of your programs and data are held by disk storage whether you are running them or not. The moment you turn off the computer, the contents of RAM will instantaneously disappear, but the contents of your disk storage will remain in tacked. RAM is also different from ROM. ROM (Read Only Memory) are memory chips that have had data stored on them which cannot be changed at all. ROM chips can be usually found on a computer motherboard. Why upgrade or increase RAM? The main reason for upgrading RAM is speed. More and faster RAM means quicker and more responsive computer performance. Upgrading RAM is considered as one of the cheapest if not the cheapest way to speed-up a computer. When to upgrade or increase RAM? When your computer is running sluggish while performing memory demanding tasks like video and graphics editing, CD/DVD burning, or while running several applications simultaneously, then upgrading RAM is one of the best available solutions. *If you have a new motherboard, check the owner’s manual or manufacturer, this is the sure way to purchase the correct type when you're adding computer RAM. *If you want to add RAM to your current motherboard, the easiest way is to see which type of RAM you currently have. First open your computer case. Remove your current RAM by pushing down on both of the retaining clips holding the RAM in place. Your RAM should have the type and speed printed on it. That's the type you need! *You can mix different memory speeds and sizes but not of different types. Like a DDR and DDR2 cannot be used together. *Stand on uncarpeted flooring to reduce static electricity. Touch as little as possible inside your machine and especially avoid touching any computer chips. Static damage, and even oil from fingertips, may cause a failure months later. Instead of illustrating the procedures on how to install, upgrade or increase RAM myself, I'm going to refer you to these existing good tutorial sites that can be found here and here. If you have some questions or needed extra help, you can always ask me later thru a comment. And then there’s always Google, when all else fails.